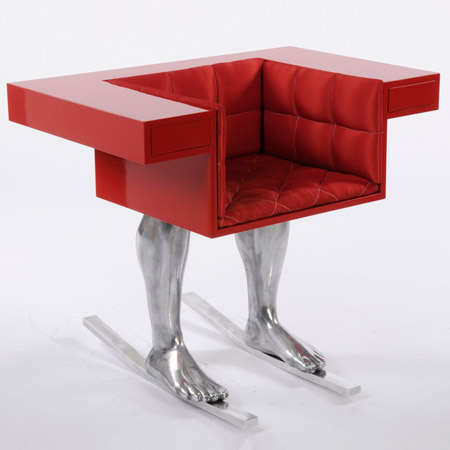 Austria-based designer David Pompa has designed a collection of office furniture called Surreal Minimalism. The collection comprises eight chairs constructed from different combinations of metal bases and upholstered seats. "These chairs are a response to mental and physical needs of people in their office environment," says Pompa. "These chairs are a response to mental and physical needs of people in their office environment," says Pompa. A recent graduate from Kingston University in London, Pompa developed the project during his MA course. Why is the situation in an office such a stereotypical scene? I think that this is the reason why people don’t feel as creative in their office environment as they feel in many other places. Our consumerist society has brought us into the position that it’s not any more about designing one more chair or one more table, it’s about designing a unique experience. I am convinced that our lives are driven very much by the relationships we have to objects all round and I think that as a designer I want to design the basis for these relations. Interaction is often reduced to a functional basis; this collection is an approach that objects and humans can interact on an emotional level with the aim of stimulating creativity. The surreal minimalism collection consists of objects which can be randomly combined to a series of office chairs. These chairs are a response to mental and physical needs of people in their office environment.